Bagan has entered its balloon ride season, which only runs every year from October to end of March. Balloon trips have been running in Bagan for over 15 years. Back in 1997, the "Balloons over Bagan" established the first commercial hot air balloon operation in South East Asia - Following Balloons Over Bagan, another company Oriental Ballooning was founded in 2013. This year, on November 23, a third balloon company, Golden Eagle Ballooning, officially launched its hot air balloon operations, intending to meet the increasing demand of tourists for a balloon ride over Bagan. Bagan is famous for its thousands of old pagodas and stupas stretching into the horizon. Cycling and Ballooning ride are two popular ways to explore Bagan among tourists. But a hot air balloon ride is the only way that tourists can get a panoramic view of Bagan. Earlier this year, hot air balloon ride over Bagan was named among "Top 10 Things to Do in Indochina Region" by Odynovo (formerly Odyssey). Balloon flights typically take place at sunrise or sunset and last around an hour. And it only runs every year from October to end of March every year. 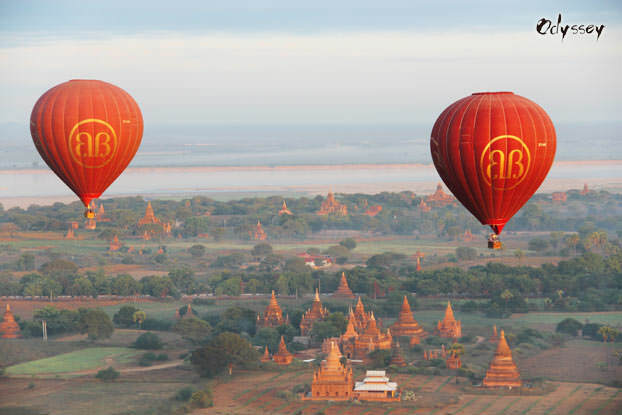 For tourists, now is the time to plan a trip and consider a hot air balloon ride over Bagan.